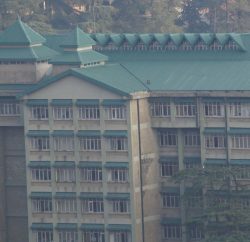 With the aim to promote mountain biking in the hill state, HASTPA & MTB Himalaya conducted a workshop with the students of St. Edward’s School, Shimla. Two international riders Robert Rankin from Ireland and Zoe Beesley from Scotland take part in the workshop. Robert and Zoe explained the intricate details about different mountain bikes and how to choose one over the other depending on the terrain and route. Details like frame, suspension, brakes, pedals, tires, etc were all discussed with significance of each depending upon uphill or downhill mountain biking. Robert pressed upon the significance of protective gear in mountain biking especially for downhill riding as well as the use of clip-less pedals in mountain biking. Zoe talked about the advantage of riding a bike over any motorized vehicle, the benefits of traveling via dirt roads and single tracks i.e. the scenery and the experience, the resultant health benefits of cycling as well as the environmental impact of mountain biking or the lack of it. The session was ended with a competition of slowest riding over a distance of 10 meters. The objective was to illustrate the technique behind developing balance on a bike. Robert first explained the way to balance the bike while standing still at one place and how to slowly move about in circles to improve upon one’s balance. First prize went to Akshit with a time of 60 seconds while Sarvesh came second with 50 seconds and Shaurya was third with 47 seconds. Winners we gifted MTB HIMALAYA goodies and an opportunity to visit this year’s event with friends and family. 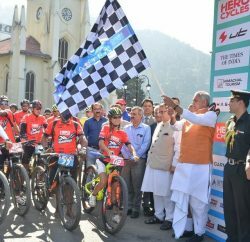 With the day well spent, attracting interest and plethora of questions from budding riders MTB Himalaya has taken the first step in including the young in this endeavor for healthy living, eco-friendly traveling and sustainable development. With many more schools on the radar, HASTPA & MTB HIMALAYA will continue to engage and guide as many young students as possible. Post the event MTB HIMALAYA 2013, HASTPA also conducts weekend camps for amateur riders, which are free of cost for all residents of Himachal Pradesh.